Two friends that didn't know they were supposed to be enemies. A young fox named Tod is taken in by an old woman after his mother is killed by a hunter. Full of mischief, Young Tod befriends Copper, a hound dog pup. As they grow up, however, their friendship becomes endangered by what they have become; Copper is a hunting dog, and Tod is his prey. Those lines of dialogue have resonated through my mind for the past 25 years, ever since Disney's The Fox and the Hound originally graced movie screens in 1981. Back then I was only 14 and definitely not a Disney fan. I thought these lines seemed insipid and pointless and showed that Disney's movies were dopey and inane. I may be much older now, but I'm also much fonder of Disney movies, so many of my attitudes toward their animated offerings have changed. However, I still hadn't seen Fox. That's because I'm a die-hard disc-boy; if I can't have my Disney movies on laserdisc or DVD, I don't want them, baby! Fox never appeared on LD in the US, and I'm not even tremendously sure of its availability elsewhere; I think a Japanese LD existed, but if so, it was long out of print, and I wasn't enamored of the idea of spending $100 plus for the movie. As such, I was quite excited to see Fox among one of the early batches of Disney's "Gold Collection" series. It's one of only a few Disney animated titles I don't already own on DVD or LD, so I looked forward to finally possessing a copy. Fox fits in perfectly with the mediocre fare that followed the loss of Walt in 1966. The studio just seemed to run on autopilot; plenty of experienced animators were still on hand, but it appears that they may have been lost without Walt's presence, even though he hadn't been very active in the animation studio for a number of years prior to his death. Fox was actually the farewell piece for legends like Wolfgang Reitherman, Ollie Johnston and Frank Thomas; it's too bad they couldn't have gone out with a winner. 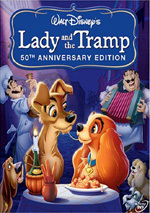 Unfortunately, the film largely looks like one of the blandest productions ever to come out of Disney animation. The animation itself seems acceptable but erratic; the pieces don't blend together as well as you'd like, and the differences between some well-drawn characters like Tod and less-effective art like for Amos Slade seem bothersome. Overall, Fox isn't a bad piece of animation, but it doesn't even remotely approach the better work from Disney. A generic quality afflicts all parts of Fox, starting with the horribly trite and wimpy songs. I thought Disney tunes reached their nadir with the lite-listening of 1977's The Rescuers, but some of the music here gives those clunkers a run for their money. Pearl Bailey's "Big Mama" at least gets a decent tune or two, though one of them bears more of a melodic resemblance to "The Bare Necessities" than I'd like. The vocal cast also seems acceptable but nothing special. Actually, elderly annoyance Mickey Rooney adds nice life to Tod the fox, but Kurt Russell does little do distinguish Copper the dog. The same goes for Bailey's owl, who never acquires much of a personality. Sad to say, the most compelling character in the film is actually the caterpillar who is chased by a couple of birds in an allegedly-humorous subplot that recurs throughout the picture. This little guy never speaks a word but there's more charm in his attempts to flee his pursuers than in the rest of the movie combined. Actually, the film's rare action scenes work pretty well. Fox generally is a fairly timid movie; it starts so gently that I almost felt like I was watching a script stolen from Barney or Teletubbies. However, a couple of pursuit scenes fire up some surprising intensity and even almost-graphic violence. I was quite astonished to see the pounding one character takes; he's hit by a train and then slams into some rocks after he falls off a bridge! Granted, I knew that this meant the character would (impossibly) survive, since a Disney film would never depict such violence if the victim bought it, but I still thought it was almost shocking. 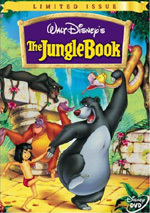 Probably the film's best moment occurs during its climax, when a large bear attacks. Many have pointed to this scene as the moment when it became clear that the new generation of animators could eventually be something special. It's regarded as Glen Keane's "coming out" and does stand as a surprisingly visceral and effective piece of work. Unfortunately, it doesn't quite redeem the film as a whole. I wanted to like The Fox and the Hound but simply found it to be too bland and unmemorable. The movie does pick up during its second half - once the characters have grown, we see less of the dull kiddie stuff that marred the early scenes - but I just couldn't get into the story. 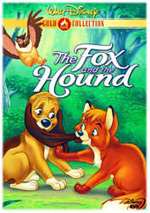 The Fox and the Hound appears in a fullframe aspect ratio of 1.33:1 on this single-sided, single-layered DVD; the image has not been enhanced for 16X9 televisions. In regard to the dimensions, it seems completely unclear whether or not 1.33:1 crops the original theatrical ratio or not. The DVD's case just states that it offers a "1.33:1 aspect ratio"; some Disney DVDs discuss whether how their ratios relate to the original theatrical dimensions, but we get no such help here. IMDB indicates that the film's aspect ratio was 1.75:1. That may well be correct, but at this point, I don't think I'm going to find a definitive answer. As for the image itself, I didn't note any significant indications that the sides were ever cropped, but I must acknowledge that I thought the picture seemed a little more cramped than I'd like at times. It wasn't so claustrophobic that I can say for certain information was lost, but it seemed much more debatable than with many other Disney titles. For example, The Aristocats clearly looks to offer a fullframe transfer that suffered from no cropping of the sides. Honestly, I wish Disney would just issue all their animated films in the theatrical dimensions and not create these stupid discussions. In any case, Fox provides a disappointingly mediocre picture. 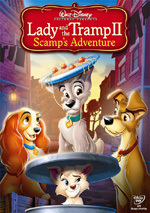 I'd been quite impressed with most of the other Disney animated DVDs, so this one is a definite letdown. Sharpness often looks crisp and detailed, but it can also be rather soft and hazy on many occasions; while wider shots tend to be the softest, this isn't a perfect rule and a number of closer images also appear bland. Well, at least I noticed no signs of moiré effects or jagged edges, and the print used seems pretty clean. I saw light graininess on a number of occasions but noted no other flaws like speckles, hairs or scratches. Colors tend to be muted but appear reasonably accurate and well saturated. Black levels actually look quite good - especially in the rich and deep fur of the bear at the end - and shadow detail seems nicely opaque but not overly so. Lose the grain and the frequent softness and you have a fairly attractive image; as it stands, however, the results are very ordinary. The same can be said for Dolby Surround 2.0 soundtrack of The Fox and the Hound. Admittedly, I don't expect too much of a mix that's now 25 years old, but this one still seems pretty bland. We get some slight stereo music in the front and a few general effects elements. These occasional blend to the rears, but don’t anticipate much action from back there. The track remains pretty restrained through the film. Audio quality also seems pretty unspectacular. Dialogue appears clear and intelligible but usually comes across as a little muted and flat. Effects are similarly bland and lack life, though they seem easily recognizable as what they're supposed to be. The music appears smooth and listenable but doesn't present much spark; granted, the fact that the tunes are all pretty sappy doesn't help, but I still found the score and the songs to lack much dynamic range. This track isn't bad for a film from 1982, but it does nothing to make it sound better than other movies from that era. Fox includes a minor batch of supplements. We find a theatrical trailer for a re-release of the film plus a pretty easy 17-question trivia game meant for kids. We also locate a disc-based storybook that allows children to read along with a retelling of the plot. The text is accompanied by drawings and you can go through it with or without narration. All this amounts to something, which is generally better than nothing, but not by much in this case. We also get a ”Let's Be Friends" booklet. This piece offers kids helpful advice such as "It's best to be yourself when you make new friends" and "You should be friends with people you like and trust". (So that's where I've gone wrong all these years!) More to the point, this booklet also tosses in advertisements for other Disney products and coupons for Disney stuff and Energizer batteries. Gotta love that Disney ultra-capitalism! The disc opens with some trailers. Here we find ads for the Disney Gold Collection and The Little Mermaid II. I genuinely like Disney animation, and I consider myself enough of a fan that I want to own each of their films on laserdisc or DVD. That is the only reason why The Fox and the Hound will remain in my collection. It's not a terrible movie but it seems to accurately represent the malaise felt at Disney for quite a few years; it's watchable and occasionally entertaining but generally bland and dull. The picture and sound quality of this DVD are mediocre and not up to the standards seen on their other DVD releases, virtually all of which have been better. Add in a weak selection of supplemental features and you have a DVD that's best left for Disney completists only.